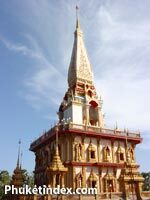 Chalong Temple or Wat Chaitararam was widely known as a holy temple containing Luang Po Cham ‘s sacredness. Today is a good day to make merit so let’s go to the temple. 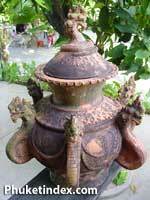 I am driving to Chalong Temple which is an ancient sacred temple visited by Phuketian people and Buddhists generally. It is believed that if we pay respect to the Buddha and make merit here, good things will come to our lives. Chalong Temple or Wat Chaitararam was widely known as a holy temple containing Luang Po Cham‘s sacredness. Luang Poh Cham was a monk who held sanctuary for ordinary people in the period of fighting with Augyee (meaning Chinese people who made a coup at that time).The history of the temple began when Luang Poh Cham gave a white holy piece of cloth to every villager to wrap around their head. By doing this, it made the villagers feel optimistic and gave them strength and they were able to defeat the enemy. (At that time Augyee called the villagers Pouk Hao Khao ). After the period of Rama V, Luang Poh Cham was appointed as Prakru Wisutiwongsajarnyanmunee who the villagers always respected. When there was any suffering, the villagers prayed to ask Luang Poh Cham to release their suffering . 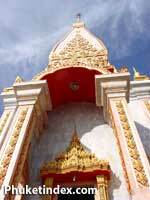 It has also been said that the walking stick of Luang Poh Cham was very sacred. If anybody had a mole or birthmark on an undesirable part of the body, the walking stick was used to stab it. After this, the birthmark would diminish in size and fade. Luang Po Chung and Luang Poh Kluam were also very well respected amongst villagers of that time. Apart from the sacred matter, both Luang Po Chung and Luang Poh Kluam were well-known as experts of herbal medicine and curing people of various ailments. Even though they have passed away the villagers still come to pay merit till this day. When I arrive at the temple area, I hear the noise of firecrackers exploding. This practice is performed as thanks by those who have had their prayers answered. Flowers and joss stick are used by the visitor as offerings when making merit. You can buy these readily prepared at the donation counter provided by the temple. the ancient temple which was located in Wat Chalong in the old days. There is no price indicated to purchase offerings as the temple would like people to donate their money as per their faith and personal condition. This donated money will support the temple for maintenance and renovation and other programs. There are also imitated Buddha images or 'Torn' (means buy in Phuket's native language) for any person who pays respect and would like to buy. Now, let's pay homage to the Buddha image first and then come back to see these imitated Buddha images later. Before paying homage to Luang Poh Cham , Luang Poh Chung and Luang Poh Kluam , we should pay homage to Poh Tan Chao Wat as tradition warrants. Poh Tan Chao Wat is the principle Buddha image in the ancient temple which was located in Wat Chalong in the old days. Poh Tan Chao Wat has two protectors. The first one is named Tao Nonsee ; the giant who maintains religious rule. The second one is named Ta Khee Lek , who always liked to smoke. It is said that if one prays or asks for winning lottery numbers and offers a cigarette to Ta Khee Lek , usually their request will be granted. Arriving at the Buddha image hall, there are seats provided for sitting whilst praying to the Buddha image. Inside the hall are artificial bronze statues of Luang Poh Cham , Luang Poh Chung and Luang Poh Kluam on which worshippers paste gold foil. For the person who likes to receive their fortune, there are casting lots provided as well. I have some trick for casting lots (maybe some of you know already). That is, if you get an undesirable result, do not take it home but leave it at the temple. In doing this, it is believed that we leave it with the monk to take care of. If you receive a good result? Always keep it with yourself. Next, let’s go to worship the relics of Lord Buddha at the grand stupa. Pra Jomthaibaramee is not yet finished but notices say that construction will be completed soon. The atmosphere inside is quiet but bright and sunny. There are many different postures of Buddha images around the hall on the first floor. There is also a drawing depicting the biography of Lord Buddha since birth, at the stage of enlightenment and then nirvana. Buddha's relics are displayed in the glass cabinet on the top of the grand stupa. 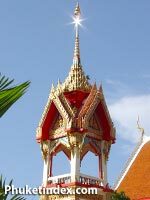 It opens for people to pay homage by providing a worship altar and a short prayer dialogue in Pali including the meaning. Next, we go to the imitated monk's house of Poh Tan Somded Chao (Luang Poh Wat Chalong). It contains wax models of Luang Poh Cham , Luang Poh Chung and Luang Poh Kluam including the ancient household furnishings, utensils and equipment which are exhibited inside the monk's house. After walking for such a long time, let's stop at a small shop to have a drink and take a seat under a tree. After relaxing, whilst walking to the car park, I see many tourists buying the imitated Buddha image. Doing so supports the Chalong temple as it is a sacred temple for both Thais and foreigners alike. Finally, I hope you have enjoyed and are delighted about this trip. I wish you all the best in making merit for yourself and others and hope to see you for our next journey. A yard in front of Buddha images hall, the ground is very hot so should step on a rough. It’s less hot.